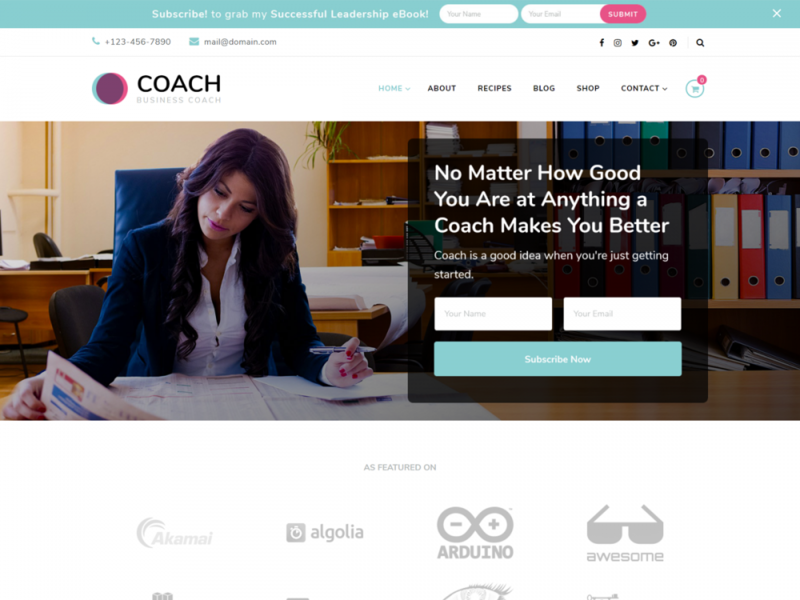 Blossom Coach Pro is a premium free WordPress coach theme designed to create websites for life coaches, health coaches, mentors, speakers and therapists. You can easily use this theme to create a stunning website without any knowledge of coding. The theme is designed with features that highlight you and yours services that will help to improve your followings. You can import all the images, text, and settings from the live demo of Blossom Coach Pro theme with a click because we believe you should spend more time on your venture than on setting up your website. Blossom Coach Pro comes with seven custom pages which include About Page, Contact Page, Event Page, Podcast Page, Service Page, Success Story Page, Testimonial Page. These pages will help you make your website truly unique and organized. Blossom Coach Pro is optimized for smartphones. With more than 50% of Google searches being done on mobile phones, this fully-responsive feminine WordPress theme is designed to adapt to any screen sizes. Blossom Coach Pro passes Google mobile-friendly test. This means better rankings in search results and better user experience. Our default theme color doesn’t match your brand color? No problem. You can easily choose from unlimited colors and change your website color to match your taste and branding with our advance color option panel. You can easily edit, add or remove any section from your footer on Blossom Coach Pro. You don’t have to simply go with our choice. Select your fonts as per your preference, and your style and brand. Google fonts make it easy for the users to choose from diverse fonts that are fast loading since they are supported by Google. You can also change the typography of body and headings (H1, H2, H3, H4, H5, and H6). Our SEO experts have put in their knowledge and experience into ensuring that search engines can easily find and rank your website above the others on search results page. It is also Schema friendly, which is an important ranking factor as per Google’s recent announcement. With Blossom Coach Pro, you will always have an edge over your competitors. You can easily create a professional looking One Page website using Blossom Coach Pro theme. Your visitors can easily access everything they need right from the homepage. Let your visitors enjoy a smooth browsing experience. Blossom Coach Pro is a speed optimized WordPress theme, which will load faster to ensure that you don’t risk losing your potential customer or new leads. Social Media Icon in Blossom Coach Pro is tastefully designed to promote your social media pages and attract new followers. Blossom Coach Pro is fully compatible with BlossomThemes Email Newsletter plugin. You can easily add subscription form using the plugin. The theme’s newsletter section combined with the newsletter plugin will help you grow your email subscribers. Blossom Coach Pro comes with unlimited background option that allows customizing your theme as per your taste. The stylish author box is added to every post page layout to help readers connect with the authors. This helps to improve visitors engagement and social media followings. Sort the order of the fifteen sections in the Homepage as you wish by drag and drop and customize your website as per your need. Introduce yourself in a fashion that will resonate with your viewers with this beautifully designed about section. The pricing section on the homepage is a great way to display different packages your business has to offer. Inform your customer know about your upcoming events with the event section on the homepage. Appreciate your past projects and celebrate your achievements with amazing achievement section which is perfect for showing before and after images. Inform and get your viewers converting to your customers with this beautifully designed Call to Action (CTA) section. Shop section on the homepage is a great way to sell the products which complement your services. Be more approachable to your website visitors by including the contact section on your homepage. Blossom Coach Pro includes a custom post type for events and success stories. With the help of Blossom Toolkit, you can also have portfolio post type. Blossom Coach pro is WooCommerce Plugin ready. Thanks to this, you can install the free WooCommerce plugin and then start selling products and services for sale, directly from your website. Blossom Coach Pro is professionally written by experts to ensure that it is clean and lightweight. This makes it very easy for developers to read comments and customize if necessary. Don’t let the language barrier stop you from creating an awesome website. Blossom Coach Pro theme supports localization so you can translate the theme into your local language. Fine-tune and customize the way your website looks, and see the changes in real time with the built-in live customizer. Blossom Coach Pro features a powerful options panel that allows you to easily customize and configure your website. You don’t have to worry about any future theme updates as Blossom Coach Pro comes with a one-click update button for stress-free updates. Write your content the way you want! Blossom Coach Pro supports right-to-left (RTL) scripts like Arabic along with LTR languages. Blossom Coach Pro comes with a comprehensive documentation of the features and settings. The theme documentation is easy to understand even to the WordPress beginners. Your website can be set up in no time! Keep your website safe from vulnerabilities with our regular updates that keep your site up to date with latest security and technical standards. Add and manage your widgets without compromising the design of your theme. Blossom Coach Pro is optimized for widgets so that you can design, and customize your website in a truly unique way. Tried and tested, Blossom Coach Pro works seamlessly on the latest version of all the major web browsers including Chrome, Firefox, Safari, and Edge. Make sure that your visitors are treated with an awesome font type that is of legible size, spaces, and contrast. Blossom Coach Pro optimizes the visual appeal of your content so that visitors enjoy what they are reading on the screen. Love the theme, and the Blossom crew! I’ve been so happy with the Blossom Coach Pro theme for my Rynski Recovery Club = excellent! It provides a peppy, perky background as well as versatility, functionality and sensational design. I was even happier with the recent support I received. I had opened a support ticket about a few issues I was having one Friday night, not expecting anything back until Monday. To my delight, the issue fixes were in my inbox over the weekend, complete with an apology about the delay. The fixes were easy, straightforward and came with an exceptional explanation. Thanks, Blossom crew, I’m loving what you do and how you do it! First off, this is a beautiful theme. I love the looks and functionality. It was exactly what I was looking for. Once installed I did hit a snag and Nabin and his support team was quick to correct the issue. Awesome! I couldn’t be happier. I am going to recommend this theme to all my other clients. Thanks again for everything, Nabin! I had the staff at Blossom Theme design my corporate website. They were such a pleasure to work with. They took my direction and, with complete professionalism, executed my ideas while adding some of their own ideas. I can’t rave about them enough. The template itself (coach pro) is really attractive and looks easy to work with on the back end. They were also really patient with me! Definitely, think about hiring them to personalize your site and take it to the next level. This was a very stressful process uploading the new themes, however Nabin not only provided exceptional customer service, but was also extremely motivating and encouraging through the process. Very knowledgable and looking for other ways to be of service. Great response time and overall 100% satisfied customer! I will be SURE to tell all of my friends and family about this high-level of customer service. The theme fits my business well, so I’m pleased that I chose it. I struggled to make a couple of things work (unknown to me, due to other plugins), and the customer service was outstanding. Fast and thorough. Great Services! Great looking Theme! I recently purchased this Theme for my new medical practice. I had a hard time to upload the theme. I contacted the customer service during Christmas and New Year period and expected longer than normal response. However, I was impressed by how hard this team work! I got respond very quickly, and even on New Year's Day! As a new start business, time matters to me a lot! I appreciate all the help I got from Nabin Jaiswal! Thank you very much! I am very satisfied with the Blossom theme I purchased, it is easy to work on and it looks great! Outstanding service, very fast response time for support. I am impressed! Thanks! This theme is full of great features and is easy to implement and customize. Their online support is outstanding. They answered my questions quickly and followed up. Well done!